Welcome to the first quarterly edition of Yin Yoga Insights. We are sending you this edition because you have expressed interest in the past in Yin Yoga. (If you do not want to receive future editions, please click the unsubscribe link.) Through Yin Yoga Insights we plan to offer a few insights into the practice and benefits of Yin Yoga. For example, in today’s edition, we are introducing the concept of the Goldilocks’ position: how deep should you safely go in a Yin Yoga pose. If you have an idea for future topics, let us know! We will also let you know about some of the interesting topics being discussed in the Forum, available at www.YinYoga.com. Feel free to join these discussions, or raise new questions and ideas yourself. Finally, Yin Yoga Insights will let you know about several opportunities to learn more about Yin Yoga via our Upcoming Events listing. You can view a short synopsis of all these items on the side bar on the right. This is not a posture, but rather advice about how deep we should go in our poses to ensure we achieve optimal health. Note, we are not talking about optimal performance! That is the trade-off we have to understand. Whenever we practice yoga, we need to be clear about our intentions: are we striving for optimal health, or are we working toward some performance goals? Athletes, dancers, and gymnasts may well be trying to maximize their range of motion, but this does not mean that they are getting healthier. Quite the contrary: many athletes and dancers have significant joint issues in later life because they dangerously stressed their bodies to obtain maximum performance when they were younger. The optimal position for health is the Goldilocks’ position: not too much and not too little. This can be shown graphically: below you will see a classic n-shape curve that illustrates the danger of being outside the optimal bounds. Remember the tale of Goldilocks and the Three Bears? Goldilocks found the momma’s bed too soft, and the papa’s bed too hard but the baby’s bed was just right. To obtain maximum health, we also need to find that place where the tension in our poses is “just right”. Not too deep, which creates degeneration, and not too little, which creates atrophy. As important as it is to find the right depth to any pose, we also have to consider how long to stay in the pose to get optimal health benefits. Every body is different, so we can only offer a generalization, but in general, every stress of tissue brings down the tolerance level of that tissue. This is what exercise is all about: we stress tissues to make them weaker, at least initially. Once we release the stress, the tissues recover and become stronger. If we apply too much stress, or hold for too long or do not allow enough rest, then we are in danger. The graph below shows how these three variables work together. 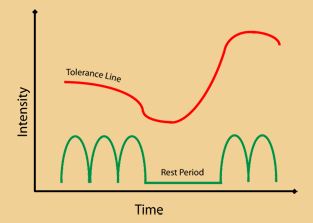 The red curve at the top of the graph shows the level of tolerance the tissue can take before becoming damaged. (These tissues could be muscle tissue, which we target in our normal Hatha (yang) practice or connective tissue such as our ligaments or deep fascia, which we target in our Yin Yoga practice.) The green curves show the degree of tension or stress being applied through either repetitive stresses or one prolonged steady stress. The horizontal axis represents time. Notice how the amount of stress that our tissues can tolerate decreases with increased stress and increased time. Eventually, if we continue to stress the tissues to the point where the two curves cross, damage will occur. However, notice the next graph. Here we see the recuperative effect of rest. Find the Goldilocks’ position in all your poses, whether yin or yang. Don’t go where it is too much (unless your objective is performance and not health.) Don’t be where it is too little either. Remember, in Yin Yoga practice, time is the magic ingredient not intensity. To go deeper in Yin Yoga means to hold longer, not necessarily to move further into a pose. As long as you are feeling it, you are doing it. Also remember, you can do too much of anything. Don’t hold your Yin Yoga poses so long that you start to exceed your tissue’s tolerance levels. Find the middle path! The YinYoga.com website has a place where you can ask any questions you may have about yoga in general or Yin Yoga in particular, or to discuss anything you have discovered that may be of general interest. Recently students have been asking questions about how Yin Yoga can affect fertility, how to do Yin Yoga with funky knees, and there has been a discussion about whether forward bending is advisable for people with osteoporosis. Click here to read more about these topics or to join the discussion, or to even start a new discussion! These courses are designed for students who have been practicing Yoga for at least one year and want to deepen their understanding of the practice. Prior experience in Yin Yoga is not required. You do not have to desire to become a Yoga teacher, but you are expected to have a passion for Yoga. With Bernie Clark on Jan 30th, 31st and Feb 6th, 7th, 13th, 14th – 2010 at Semperviva Yoga Studios in Vancouver, B.C. This training will be held over three consecutive weekends. Click here to learn more. Semperviva Yoga Studios, B.C., Canada Mark the dates! This is early notification of a one-week, 50-hour, intensive in Vancouver late August. This intensive is being held due to the demand by many students for a Yin Yoga teacher training course to be held in the city of Vancouver over one week, rather than over several weekends. For more details or to register, check the Semperviva web page or call them at 604-739-2009. Yin Yoga related workshops in Vancouver, B.C. Bernie will be conducting several workshops in January & February, 2010 relating to Yin Yoga. For full details and to register you can contact the Semperviva Yoga Studios at 604 739-2009 or at www.semperviva.com. Below are some descriptions of the workshops that are open to everyone regardless of background or experience. In this workshop we will look at the body in a unique way. We will begin by looking at the physiology of the tissues of the body and how our yoga practice affects these tissues. Next we will investigate the ranges of motion of the eight major joints of the body and discover what stops us from going deeper into poses, when to push further and when to accept our limitations. Finally we will look at what all this means for you personally and how your own unique anatomy affects your practice. This workshop is for all levels from beginners to instructors. Yoga and the Joints is an advanced look inside the key joints: the shoulders, the knees, the hips and the spine. This workshop follows the Anatomy workshop and continues to look in more depth at the four major areas worked in most yoga practices. The structure of the joints, their ligaments and main movers (muscles) will be reviewed. The way the joints function and how to move them safely will be presented. The implications of the safe ranges of motions of these joints on the practice of asanas will also be investigated. This will include looking at the way to come into a posture, come out of a posture and the alignment while in a posture. In this workshop we will investigate the various models the Yogis of India, the Yogis of China and the Medical Scientists in the West have developed to explain the workings of the body’s energy and its associated systems. We will explore the world of prana and the energy channels and vortexes of Indian Yoga (called nadis and chakras) and contrast it to the world of Chi (Qi) and its associated network of channels (called meridians) utilized in China. Then we will discover how modern scientific investigations in the West are finding remarkable parallels to these ancient models. In this 2-hour workshop, we will use the practice of Yin Yoga to help us get in touch with the Energy Body, which in Yoga is called the Pranamaya Kosha. The Indian yogis called this energy, “prana.” The Daoist yogis in China used the more ubiquitous term, “chi”. Today, Western scientists have detected similar energies, but eschew the poetic Eastern terms in favour of more medical descriptive ones, such as “bioelectromagnetism”. We will explore how to stimulate and direct the flow of these energies through our physical yoga practice and through mindfulness training. The second principle of Yin Yoga is to come to your edge, but no further. But, what is our edge? How far should we go in our postures? The answer depends upon your intention: are you striving for maximum health, or for ultimate performance. These are two very different goals, with very different consequences. For best health, stay in the “Goldilocks’ Position” where the sensations are not too little, but not too much either. Click here to learn more. On the YinYoga.com website there is a Forum where anyone can ask questions about Yin Yoga or other topics, and everyone is free to offer wise commentary. Recent topics have included discussions on Yin Yoga and Fertility, Yin Yoga for the knees and Yin Yoga and Osteoporosis. Click here to learn more. There are several Yin Yoga teacher training courses being held by Bernie Clark in 2010. The first one starts on Jan 30th and runs over 3 weekends. The next one is the annual 7-day retreat held at the rugged Sea-to-Sky retreat centre near Whistler. There will also be a 6-day course in August held in Vancouver. Click here to learn more. For those interested in learning more about our unique anatomy and how it affects our yoga practice, or for those interested in learning more about “energy” from both an Eastern and Western viewpoint, check out these workshops in Vancouver. Click here to learn more.